You know those days when you just HAVE to slip into a ratty 10 year-old shirt and the comfiest boxers in sight? To be honest, that's my weekend uniform (C'mon, tell me I'm not the only one!)! Haha! If you're anything like me, this is the perfect recipe to go with that outfit. 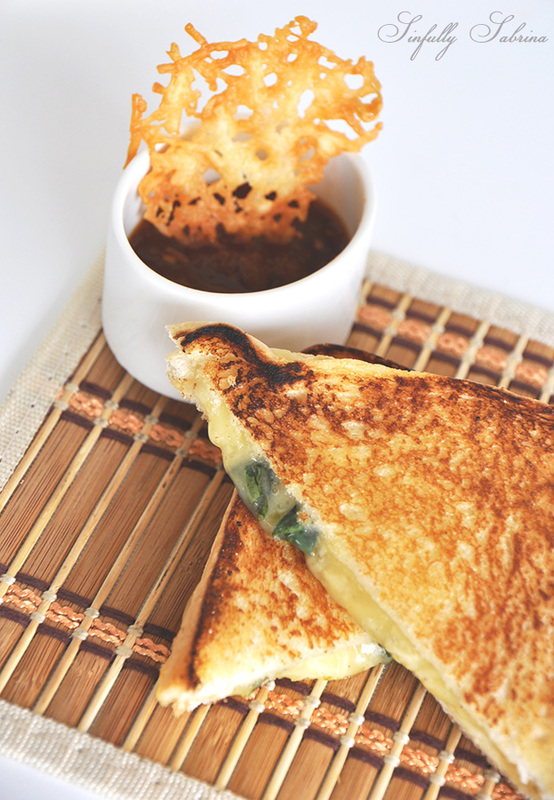 You don't have make your way to trendy cafés just to enjoy a comforting grilled cheese with basil sandwich paired with a tomato-balsamic jam. You can make it at home and eat as many as you'd like, no judge-y eyes here (no hipsters either)! n a saucepan of boiling water, drop the tomatoes and let boil for 1 minute. Drain the tomatoes and drop all in a bowl of ice-cold water (to stop the cooking process). Once tomatoes are cooled, you can easily peel it because of the X you sliced at the bottom. When all the tomatoes are peeled puree it in the blender. In a small saucepan pour the tomato puree and balsamic vinegar. Bring to a boil and simmer for about 15-20 mins. Taste and adjust seasoning with salt and sugar, depending on how sweet you like it. Simmer for another 5 mins. to reduce more. On one bread slice, layer the havarti cheese, torn basil leaves, parmesan cheese and another slice of havarti cheese. Top with the other bread slice. Brush both sides of the sandwich with softened butter. Grill in a skillet or non-stick pan for about 2 minutes on each side. Slice diagonally to expose the melted cheese. Serve with Tomato-Balsamic Jam (recipe above) and a Parmesan crisp (see notes). For the pretty Parmesan Crisp, I just sprinkled some Parmesan cheese on baking sheets lined with parchment paper and baked it at 375 degrees Farenheit for about 3-5 minutes.